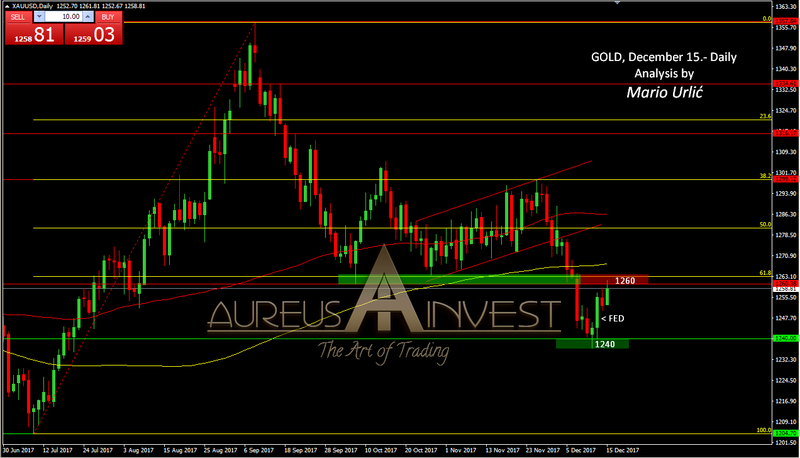 The only support which we have pointed on December 07. in between broken 1260 and 1205, the 1240, stopped the free fall on gold in the beginning of this week. The buyers were strong and they didn’t gave up until FED’s rate hike decision. On decision from FED to hike rates from 1.25 to 1.50% they have pushed the precious metak back up toward 1260, which is reached today. I see this level as a strong resistance and tough to break easily, so it will be interesting to see how will bears react. This is their teritory now, let’s watch and see the reaction. First support on the way back waits at 1254 (pp), follows the stronger one at 1248/50. Btw. Be very carefull, it’s December, the end of the year and everything is possible (as always :), despite the technical levels. Funds will adjust a performance for sure all over the market.